This entry was posted in Uncategorized and tagged Recipes, Vegan, Vegetarian. Very nice! I am always impressed with homemade cranberry sauce. I am not one of those people, but that’s because my focus is on making my grandmother’s stuffing! Love the GM in it. I always sort of loved the gelatinous texture 😉 But it looks like this one might be good enough to be worth a try! When I was a kid, my mom would sometimes pop open a can of cranberry sauce and serve it with dinner and I loved it. A few years ago I tried it again expecting to still love it and… well… not so much. I should ask my mom if she has shopped for ingredients for our cranberry sauce – if she hasn’t, I will offer to make it, and if she has, I will make it for Christmas as I know any recipe endorsed by you is as good one!! Do you just eat your cranberry sauce plain? I do, but I think it would be good as spread on a sandwich with leftover turkey! I love eating the leftover cranberry sauce on leftover turkey sandwiches the next day. 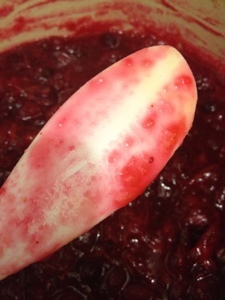 For non-thanksgiving meals this cranberry sauce also works great with pork loin. You just do a super simple pork loin (seared on the stove top, then finished in the oven), slice it up and serve it with some cranberry sauce spooned on top.